Several shifts have taken place in the workforce and the job market since the recession several years ago. These shifts impact the way we hire and retain top talent, how we conduct our job search, and how we define career satisfaction. How can you have a successful career transition? As a resume writer, brand strategist, and career consultant, a consistently recurring theme I see in conversations with clients is an increasing desire, need, and willingness to embrace the potential for career transition. This includes parents and other professionals looking to re-enter the workforce after a period of leave, individuals shifting away from struggling industries, and those looking to apply their transferable skills to a new industry or specialization. The potential for change is no longer limited to a lateral or upward movement within one’s field – it’s multi-directional, and it’s about recognizing opportunities to which we can match our own value and expertise. The success of a brand – and in my humble opinion, a resume as well – rests in its ability to craft an impactful, interesting, and relatable narrative that speaks to its target audience and communicates the value it has to offer. There are a thousand casual shoe brands out there – what makes the TOMS brand unique? The brand is rooted in a narrative around how their product not only brings value to its customers through comfort, utility, and style, but also how its philanthropic-minded practices as an organization add to the greater good, by donating goods and proceeds to communities in need. That’s a much more powerful story than simply touting product features and benefits. The same principles apply to your resume and personal marketing strategy – what other unique assets or attributes can you bring to the table versus someone with a more traditional background in the field you’re looking to transition into? If you lack direct experience in that industry, for example, what transferable skills and personal qualities do you consider strengths that will add value in some way? The resume can be a tricky place to delve into your reasons for making a career change. So utilize the cover letter, LinkedIn, social media, your website, or even your bio to craft your narrative and tell a story around why you chose to pursue a new focus, and how you’re positioned for success. – Align your LinkedIn and social media profiles with your target position. This includes updating your location (if relocating), your industry designation, and potentially even your headline if appropriate. – Start connecting with thought leaders, hiring managers, and peers in your target field. Build those relationships so that you might be able to leverage them when the time comes to make a move. – Identify companies of interest and build a list of top prospects that you want to pursue. Get to know their culture, product, and audience, and identify any applicable connections between your experience and those areas. – Discuss your plans openly with friends, families, and colleagues if you feel comfortable. Not only can they offer potentially beneficial feedback, but you will start to solidify your new “persona” and bring energy and effort to those goals. 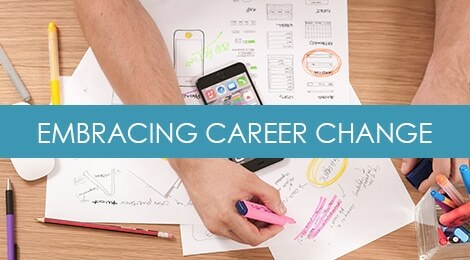 The biggest challenge candidates meet in navigating career transition is remaining competitive against peers who bring more traditional experience, practice, and skill sets within their target field or industry. While you may have transferable skill sets that can apply across industries or specializations (client relationship management, communication, presentation and public speaking, writing, etc. ), it’s also important to identify the gaps. What critical skills or experience do you need (and may potentially lack) in order to convince hiring managers that you can be successful in the role? How can you build those skills, or even compensate for those areas with other attributes? A recent client was looking to leave a 15-year career in the financial sector and honor her personal passion for fitness by targeting a client-facing role within a wellness startup. Problem is, she has neither startup nor wellness experience on a professional level, which impacted her competitiveness. She did have the transferable skill sets in terms of account management, client services, leadership, and project coordination – but it would still be a tough sell against more traditionally qualified peers. She recognized a need to appear technically savvy in order to appeal to a dot-com organization where the product is heavily technology-based. So she decided to take coding and design classes to build her knowledge in those areas. Would they be part of her day to day work? Not likely, but it demonstrated initiative and highlighted her understanding that she would need to be able to speak the language of technical and design teams in order to be successful. The ways in which the modern job market has seemed to embrace career transition is certainly beneficial. It’s opened up a plethora of opportunities to repurpose and leverage our talents in new ways, build exciting brands poised for growth, and create careers and lives more aligned with our values. But it also poses a distinct challenge in how to effectively market oneself and instill confidence in hiring managers. Anticipating and responding to those challenges with a solid brand, compelling narrative, and professional portfolio of tailored marketing tools that help you tell that story and communicate your unique value is the key to successful career transition. If you’re considering a career change, a solid resume that highlights and sells your transferable experience and skills is key. Check out our suite of resume and branded content services. Tags: career change, job search, personal branding, transition. Bookmark the permalink.